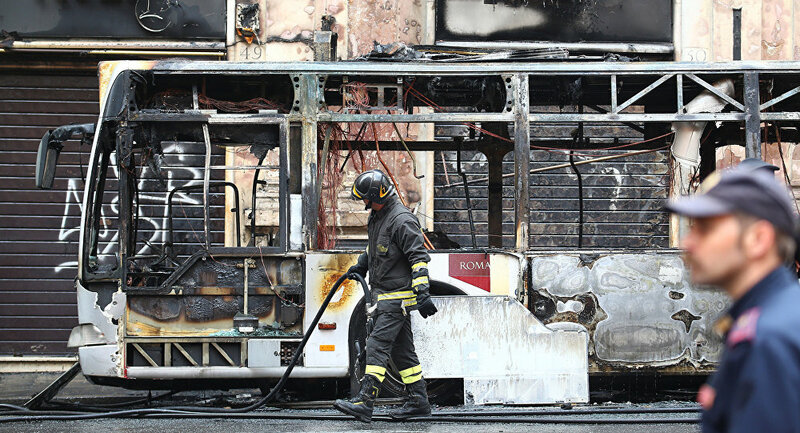 The bus stopped near the Trevi fountain at around 10 p.m. local time on Tuesday and then was caught on fire. People had been evacuated before the flames engulfed the bus. According to the recent data, no one has been injured in the explosion. Following the incident, local prosecutors and the public transport service ATAC opened an investigation into the cause. — BlitzTV (@BlitzTVit) 8 мая 2018 г. Buildings around the burning bus have been covered with smoke and blackened with ash. — Antonio Naddeo (@AntonioNaddeo) 8 мая 2018 г. ​This is the ninth bus explosion this year in Italy, with the country's media blaming transport authorities for aging bus fleet and poor maintenance.